To kick of London Fashion Week Liz Black unveiled her fifth ready-to-wear collection, transporting guests into a truly magical world with her Alice in wonderland inspired collection. The collection was showcased in a Mad Hatters Tea Party themed presentation, with two rows of mannequins showcasing the collection on either side of a long white table. 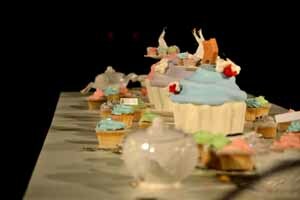 The table was fully decked out for an afternoon tea party with colourful cupcakes, a weirdly wonderful teapot set and transparent chairs awaiting the trio of models. It was a charming concept and had spectators buzzing with impatient excitement as we waited to see the Autumn/Winter 13/14 ‘Wear Me’ collection. Guests were greeted in Freemasons’ hall with marble floors, tall pillars and ornate decor providing the perfect backdrop to the demure collection. 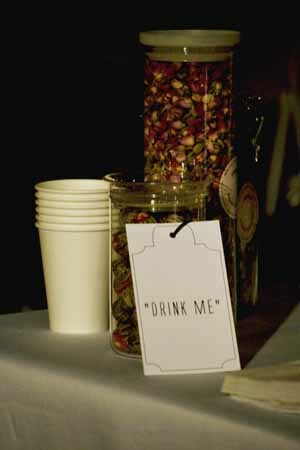 After nibbling on cupcakes, with pastel coloured icing and sipping tea with a label that ordered ‘Drink Me’, the wrought iron work gates opened at last and guests flocked into the presentation room. 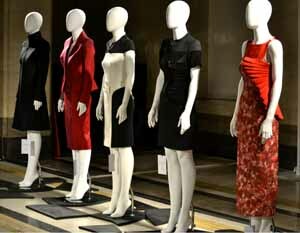 Beautifully crafted, the collection was chic and elegant, yet modern, with a hint of whimsicalness. 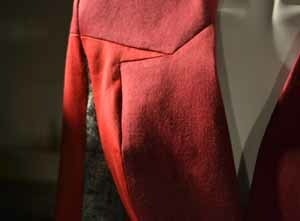 Luxurious fabrics and block colours were worked into wearable pieces – creating sleek, figure-skimming silhouettes. Far from simple, an interesting texture or pattern was always worked into the classic designs; whether it was the little black dress with textured panelling and a sheer top section, the patterned midi dress with a textured, fan-like side feature, or a block colour suit sporting snake-skin print panelling under the arms, the timeless tailoring was updated with a modern and creative twist. With the showcase taking the form of a presentation, you could view the collection up-close, taking in the cleverly crafted details of the collection – it was nothing short of immaculate, imaginative and luxurious. The collection showcased on the mannequins were fascinating enough, but then the lights went down and music boomed out into the room as a trio of models brought to life the collection’s statement pieces. A pixie-faced model walked down a red carpet, wearing a white dress with statement shoulders and square-cut neckline; it was powerful, yet feminine and elegant. Sporting bizarre slicked back hair and playful make-up the model wandered around the table, helping herself to afternoon tea whilst wearing a bewildered, wide-eyed expression. It’s fair to say she executed the odd Alice in Wonderland character with just the right degree of bizarreness. Shortly afterwards another model waltzed into the tea party, sporting a monochrome panelled dress with a cute cut out bow. This dress was the epitome of elegance, but for the bow detail and triangular cut neckline, which gave a playful twist to the design. 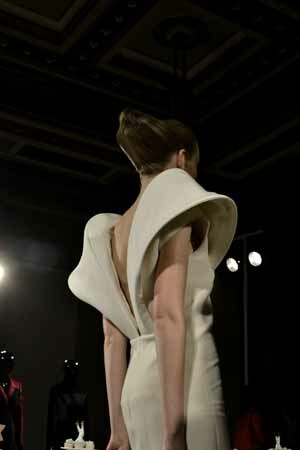 The streamline, slimming dress displayed Liz Black’s subtle perception of the mad Alice in Wonderland tale. 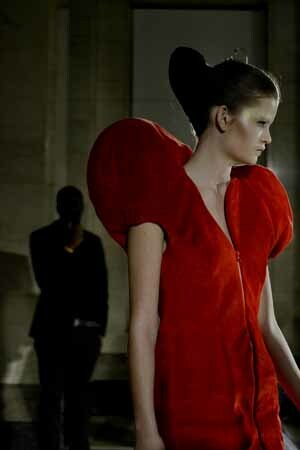 The collection’s statement designs were finished off fabulously with a moody queen of hearts strutting into the tea party in red-wedged heels and a structured heart-like dress. It was distorted sophistication but bizarrely beautiful. 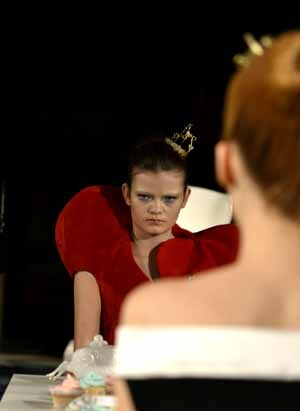 The deep red colour and strong texture of the queen of heart’s dress emphasised the dark side of Wonderland. 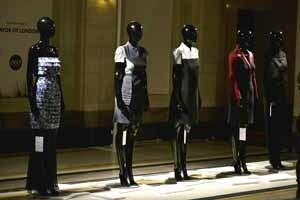 Liz Black’s presentation was an enchanting showcase of refined creativity. The wearable statement pieces captured the hearts of every guest with the rich hues, luxurious textures and feminine cuts defining the Liz Black woman as boldly sophisticated, with a whimsical edge. The ‘Wear Me’ collection was timeless elegance and couldn’t have been presented in a more delightful way. It was undoubtedly a Fashion Wonderland.